Replacing conventional grinding wheels with a CBN Grinding Wheel is proven to cut your production cost and increase your productivity rate. 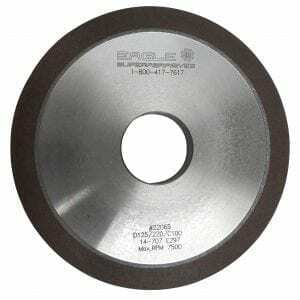 Eagle Superabrasives is a premier supplier of CBN grinding wheels and over 6,000 other superabrasive supplies. Ninety-percent of orders are made on location at our Hickory, NC, where they are ready for same-day shipping. Custom orders can be shipped in as little as seven days. Diamond has been recognized as the best superabrasive to use in the grinding industry. Diamond is the hardest material known, making it ideal as a superabrasive. However, diamond begins to lose its strength under intense heat and workloads. cBN or cubic boron nitride is a superabrasive that has been specially created to fill in the gaps where diamond fails. The first advantage of implementing a CBN Grinding Wheel over a Diamond Grinding Wheel is when grinding at high-speed. High-speed grinding is very useful if correctly applied by using an increased feed speed or infeed that will reduce grinding time, all while the cutting force remains constant. CBN is great for high-speed cutting because it can withstand the high temperatures. High-speed grinding is great is practical when heavy stock removal is desirable. CBN has a higher thermal resistance than a diamond. When temperatures exceed 800 degrees, CBN is proven to be harder than diamond and is able to maintain its cutting edge well up to 1000 degrees. As well a high thermal resistance, the thermal conductivity of CBN is four and a half times better than copper making it rival diamond. Why use a CBN Grinding Wheel? CBN Grinding Wheels are considered the superior choice compared to conventional abrasives such as silicon-carbide and aluminum oxide. The strength and resistance to thermal and chemical attack helps maintain sharp cutting edges, making it the superior choice. As well as beating out conventional abrasives, the high thermal stability makes CBN the best choice for grinding of all varieties of steel alloys, where diamond abrasives are not normally employed. If you would like to read more about CBN Wheels click here. When you’re ready to try the best, trust the experts at Eagle Superabrasives. Our experienced staff will provide you with superior customer support and service. They will deliver prompt, insightful technical support and advice on any product you purchase. For superior products delivered with customer service, contact Eagle Superabrasives today!